We have now added Ken Reeves to our terrific group of speakers. Ken is a legendary coach in Southern California and his list accomplishments include 19 cross country state meet plaques and 11 state championships. He is also one of the most respected and entertaining speakers. You can check out his complete bio below. Ken is a graduate of UCSB where he was an All Conference soccer player. High school and college coaching experience include stints as head and assistant coach in soccer, cross-country and track and field. The majority of his high school career was spent as head track and field and cross-country coach at Nordhoff High School in Ojai. There, his teams captured 11 California State titles in cross-country. He joined the Amateur Athletic Foundation coaching education program under the direction of Skip Stolley in 1992. 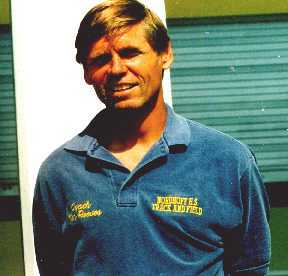 Ken is a co-author for both the AAF (now LA84) Track and Field and Cross-Country Coaching manuals. He has presented at track and field and cross-country clinics for LA84 and other organizations since 1991. Today, he is a lead instructor in the LA84 cross-country clinics and an assistant program director in charge of running events for the LA84 track and field clinics. He also continues to announce numerous meets in both cross-country and track and field including the Mt. Sac Invitational, the Mt. Sac Relays, the Clovis Invitationals and the CIF SS Prelims and Finals. Ken has been inducted into the Ventura County Sports Hall of Fame, the Mt. Sac Cross-Country Hall of Fame and the CIF Southern Section Hall of Fame. He is a member of the Cross-Country Journal editorial staff and he has twice been selected as the National High School Cross-Country Coach of the Year. Today, he assists numerous programs with periodization of training, the development of young athletes and the rehabilitation of injured athletes. Also speaking will be Oregon assistant coach, Maurica Powell, Acalanes HS coach, Joy Upshaw and UC Davis Director of Cross Country and Track and Field, Drew Wartenburg. If you sign up before April 1st, you will get a $50 discount off our regular price of $300. With your registration, you will receive a pair of New Balance shoes, camp shirt, camp notebook, our great lineup of speakers and much more. If you have any questions, please email us at bayarearunningcamp@gmail.com. Steve Cram Races...12 Of The Best! !